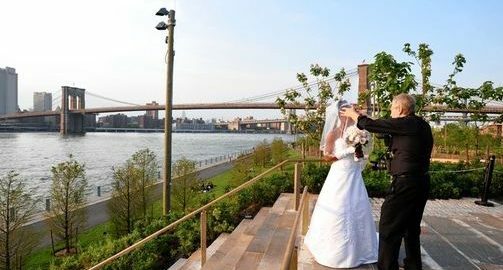 Bride-to-be Jenn Jarvis thought she had found the perfect venue for her wedding this year: Brooklyn Bridge Park, a waterfront expanse with emerald lawns and sweeping views of Manhattan, all for just $25. “Our awesome caterers, event planners, said, ‘It will be gorgeous and lovely, and it’s only a $25 permit fee,’ ” she said. She soon learned, however, that on Dec. 1, the nonrefundable fee quietly jumped to $425. While the increase wasn’t the last straw that prodded Ms. Jarvis and her fiance to hold the wedding elsewhere, it was a “pretty big straw,” she said. As wedding season gets under way, many couples are learning that exchanging vows in a public park can come with a host of bureaucratic do’s and don’ts. In most New York City parks, there is a $25 permit fee for gatherings of 20 people or more. Two locations–Brooklyn Bridge Park and the Conservatory Garden in Central Park–charge an additional $400. And for couples who pay online for a Brooklyn Bridge Park permit, there is an extra $1 processing fee. And that is just to say “I do.” Couples who got married elsewhere but just want the park’s dramatic backdrop for their wedding pictures may also need to pay for a special permit. At Brooklyn Bridge Park, the photo fee is $26, and at the Conservatory Garden, it is $100. Still, they aren’t the city’s most expensive options. At Gantry Plaza State Park, a 12-acre riverside plot in Long Island City, Queens, wedding permits range from $800 to $1,600; if the bride and groom want chairs, decorations and sound equipment, it could cost more. An after-hours event on Liberty or Ellis islands, both run by the National Park Service, costs up to $20,000 for 1,200 guests, with security, transportation and catering extra. The no-frills option–an hour-long standing ceremony with 75 people–is $75. The park, which is run by a nonprofit, doesn’t receive government money for maintenance and operations, she said. Plenty of couples are willing to pay. Already this year there have been 110 weddings or wedding-related permits issued at Brooklyn Bridge Park. The lush Conservatory Garden at 105th Street and Fifth Avenue hosts about 10 to 15 weddings a week from April to November, said Dena Libner, a spokeswoman for the Central Park Conservancy. The wedding fee increased to $400 from $100 about nine years ago, she said. The fee is a “reflection of the sheer demand” for the garden as a backdrop, she said, and the “enormous work” required to maintain it. “We would politely tell them that a permit is required for photography in that section, and if they were unable to pay it…we would gladly point out some other locations at the park that are just as beautiful,” she said. Enforcing the permits can be an art. A woman in a flowing white dress might catch the attention of park officials, while more simply attired brides might not. Brooklyn Bridge Park requires a permit only for “extensive” shoots involving, for instance, a lengthy setup time or equipment, Ms. Ryan said. On Saturday, Jason Lapuebla, a 28-year-old photographer from the Bronx, was shooting a couple at the Conservatory Garden without a permit. He said he’s never been chased away, but in the past he has been asked whether he has a permit. “Sometimes, even if I’m just shooting something personal with a friend, police or park people in the city will ask for a permit,” he said. After permits are obtained, couples often still have to abide by a host of restrictions. Michelle Wiener of Brooklyn considered having her wedding at Brooklyn Bridge Park, but she ultimately found the tight rules–not the fee–too onerous. No staging, microphones, tables, podiums, tents or loud music can be used for the ceremony. Only five folding chairs can be brought. No more than 100 people are allowed. Ms. Wiener said it was too much. “If I were to pay $400 to use a corner of the park for an hour or less, I should be able to provide the means for guests to be comfortable and hear the ceremony,” she said. –Danny Gold contributed to this article.